I recently picked up a pack of Reaper Samurai figures from their Dark Heaven line of metal miniatures - I saw them on the rack at Just Games and couldn't say no. And I immediately began planning *yet another* Frostgrave army. I haven't decided yet if I want to go with Sigilist (for the calligraphy connection) or Enchanter (for the almost mystical amount of work that went into forging a katana) as my wizard's school, but I do have an army list drawn up, one composed of, appropriately, Seven Samurai. Just about the only thing I needed to track down was a pair of appropriate archers. 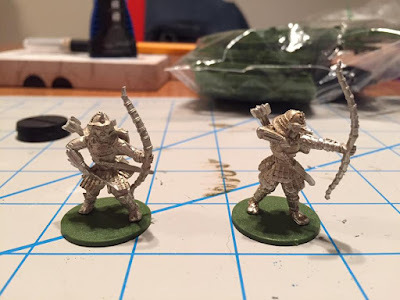 Nothing I was turning up on Google appealed to me, so I put out a call on the Frostgrave Facebook group, and a kindly gentleman offered me a pair of samurai archers, from the "Legend of the Five Rings: Clan Wars" miniatures game, now long out-of-production, for $3 apiece plus shipping. I swiftly took him up on this, and they arrived yesterday. Today, I trimmed away their metal tabs (I'm not a fan of slotta-bases), cleaned up the flash and mold lines that I could find/access with my X-acto, and glued them down to my preferred bases, 25mm Renedra flat rounds. I can't keep the cat away long enough to open the porch door (our apartment has a screened-in porch where I do my priming) and prime these fellows, so hopefully tomorrow morning I'll get them out there and get a quick coat of primer on them. I think with this I'll have all the Frostgrave warbands I intend to paint - I have a primed-but-unpainted Witch warband based on the 1982 CONAN THE BARBARIAN, these samurai, the Choosers of the Slain, the Undying Host of Sutekh-Ra and the Diabolists of Belphegor. How many more warbands do I need? I might hold on to the Seven Samurai and the Cult of Set warbands until the Painting Challenge begins this year. I think that might be a good beginning to my participation this time around. "All the Frostgrave warbands that I intend to paint" - I think we both know that is not true. Looking forward to seeing these painted Bill. LOL--- Projects are almost never completed only abandon.